2 Cottages for Rent – Location – Location – Location! Situated directly on Trinity Park overlooking the Tabernacle, this unique property, newly renovated and expanded in 2012 and 2013, boasts 2 cottages and one of the largest yards on the park. Nearby parking for 2 vehicles (though it’s walking distance to ferries, Circuit Avenue and the famous Inkwell Beach). Perfect for a vacation with friends or extended family, each cottage has 2 bedrooms, its own fully equipped kitchen, 1 1/2 baths, a washer and dryer, living areas, a porch, and an outdoor shower. 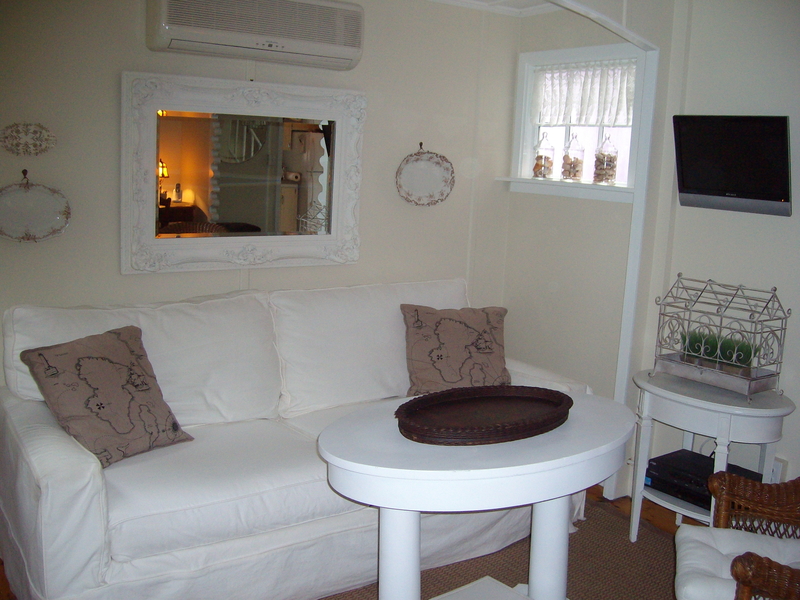 Cottages may be rented together for up to 10 people, or separately for 4 to 6 people. Our guests have full use of the lovely perennial garden with umbrella tables, and a courtyard between the cottages offers a serene, private environment. Every appointment inside the cottages makes for any easy, comfortable transition to island life. Mixing vintage and new, our guests enjoy every modern amenity, but with a nostalgic glimpse of days gone by. This is not your ordinary rental. The front cottage, number 72, Dalla Nuvola (From the Cloud) easily accommodates up to 6 people with two bedrooms on the second floor, one with a queen bed (flat screen and en-suite 1/2 bath) and one with 2 twin beds; there is also a pullout queen-size sofa-bed downstairs. The first floor has a living room (with flat screen and DVD), dining room, full bath with washer and dryer and full kitchen including dishwasher. There is air conditioning on both the first and second floors, and an outdoor shower and wireless internet. Number 73, La Pensione (The Guest Cottage) can accommodate up to 4 people with two bedrooms on the second floor, one with a queen bed (flat screen and en-suite 1/2 bath) and one with a double bed. The first floor has an open floor plan with living (with flat screen and DVD), dining, kitchen including dishwasher, and full bath with washer and dryer. There are ceiling fans in both bedrooms, an outdoor shower and wireless internet. ​A large gas grill is available in the yard for use by both cottages. All beds have brand new mattresses and pillows. Beautifully crisp white vintage chenille bedcovers and handmade quilts, bridge the old with the new. Interiors are fresh and relaxing. Tenants to supply their own sheets and pillow cases, towels and beach towels, and paper products. Tenants may, upon request, rent sheets, pillowcases, towels and beach towels. Check-in Saturday at 3:00 p.m./ Check-out Saturday at 10:00 a.m. Unfortunately tenants may not bring any pets along and there is no smoking allowed inside the cottages; ashtrays are available for use outside. These cottages are only available 6 weeks per season. For availability, rates and, more photos, please visit our website at TwoCottages02557.com and/or contact Janet at [email protected] or 401-954-0425.